A camera in everyone's hand. Nowadays we use our smartphones for making calls, for checking emails, for professional networking, for hooking up with friends and family on our social network sites, for listening to music, ... and of course for taking photos. However, it is very rare that we print off any of these photos which we tend take almost every single day! STRÜKLA is a POLAROID-like on-demand printer directly connected to event attendee’s smartphone. So let’s start inspiring participants and attendees to take more pictures during your event! No app to install! This brings compatibility with most of the smartphones on the market. 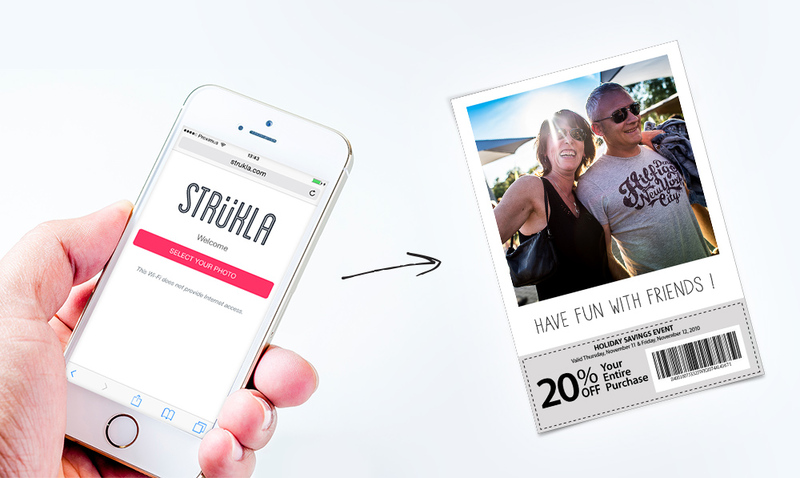 STRÜKLA prints your photo in a few easy steps and it takes less than a minute to complete. Your audience leaves your event with an unforgettable souvenir. Made by themselves, for themselves. A space is available at the bottom of each photo. STRÜKLA gives you this feature which allows brands to insert coupons, sales promotions or even their logo at the bottom of the picture. STRÜKLA may be used everywhere. No Internet connection is required. a power outlet. Then you simply just plug and play.